Starting GPS Co-ordinates: N51 08' 30" W000 96' 20"
Finishing GPS Co-ordinates: N51 07' 10" W000 96' 20"
We drove this lane from north to south. 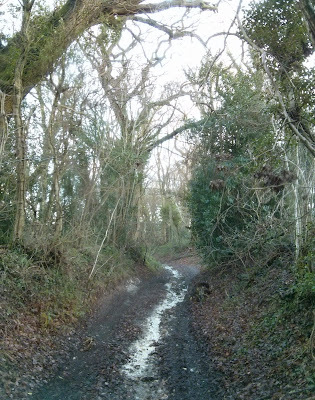 Leaving a country road just south of the village of Newton Valence, the byway proceeds as an earthen holloway with an underlying firm chalk surface, so the going is easy, even though the very occasional holly branch will make the paintwork protest. Climbing uphill towards Cuckoo Copse the gradient shallows out almost completely, the greenlane leaves the woodland behind and takes a right-angled curve to the south to proceed between high hedgerows. At this stage the surface is in very good nick, well drained as it is on a firm surface with a grassy centre. Following the field boundaries, the byway then curves back slightly to the east before taking another relatively sharp turn to the south east, finally cresting a hill next to the 'trig point' 220m AMSL and ending back on the tarmac just south of Goleigh Farm. Please note: the byway opposite the southern end of this track is subject to a TRO and as such you cannot continue down it in a four-wheeled motorised vehicle. To Hampshire County Council these are Byways 12 & 21, combined here for convenience.